Bothies have always fascinated me. I stayed in a few when I was little, but I’ve vague memories of the experience. It’s other people’s stories that have shaped my concept, my slightly romantic notion, of these shelters in the Scottish hills. Mum and dad and their friends would talk about Shenavall, Camasunary, Suileag – beautiful names that spoke of exploits in wild lonely places, of mountain days and bothy nights, of blazing fires, whisky and camaraderie. 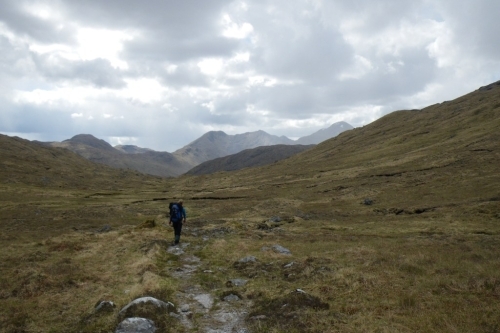 The Rough Bounds of Knoydart. But the time comes when you have to shape your own story. And so it was that a few weekends ago my friend Morven and I stood at the tip of Loch Arkaig, rucksacks on, taking in the moorland and mountains that lay ahead. We were about to enter the Rough Bounds of Knoydart for our very own bothy adventure. Morven and I have known each other for years. Our parents were best friends and hill-walking pals, so we share the same tales; the same memories. Indeed, our initial plan was to recreate an epic four-day bothy trip that our mums made into Knoydart many moons ago when we were toddlers. Too epic, we decided, and plumped for something a bit gentler: park at Strathan, walk to Kinbreak bothy in Glen Kingie, on to A’Chuil bothy in Glendessarry and then head back to the car. Two nights, no big hills and fairly short walks in and out. 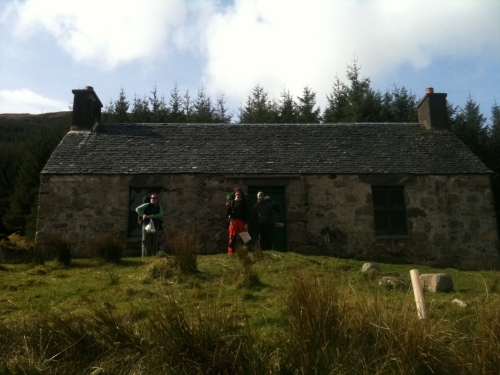 Outside Kinbreak – my first (sort of) bothy. I say no big hills, but as soon as we set off we were climbing. My thighs burned as we worked our way up, gravel crunching underfoot. The path was dented with deer tracks and dotted with indigo-blue flowers. Little spiders with fat bodies scuttered across the ground, disappearing down holes. Morven and I chatted, stopping every now and again to catch our breath and look back at the view that was opening up as we gained height – a mass of bare hillside, marked only by the craggy fingers of mountain burns. The call of a cuckoo, its cry for a mate, echoed across the loch. The sun beat on my back. I felt a few snow flakes, as dry and light as a feather, land on my nose. I looked up, searching for a cloud in the empty blue sky. We headed for the beleach, the pass through the mountains. As we reached the top, a vast, new landscape revealed itself. Glen Kingie, a great curve of a glacial glen, swept below us, a river carving and snaking its way along the bottom. I stopped to feel the size of the space and the size of the silence. The old ruin house, roofless, came into sight first. Kinbreak bothy, probably the old byre, sat next to it at the bottom of the hill. I pushed the front door open to see a damp cobbled floor, a collection of saws and a ladder leading up to a trap door. A penthouse. I scanned the room upstairs. 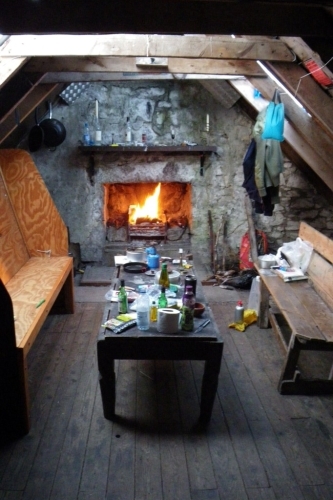 Wooden floor boards, a big stone fireplace, an empty bottle of Aberlour with a well-melted candle stuck in it, some coal, a bit of kindling, a table covered in blobs of wax, two benches, a pack of cards, a tube of toothpaste and a bothy visitor book. Partly for safety, partly for memoir, everyone who passes through is meant to leave a comment: where they’ve been, where they’re going, what state the bothy was in, drinks drunk, hills climbed, dry days, wet days. 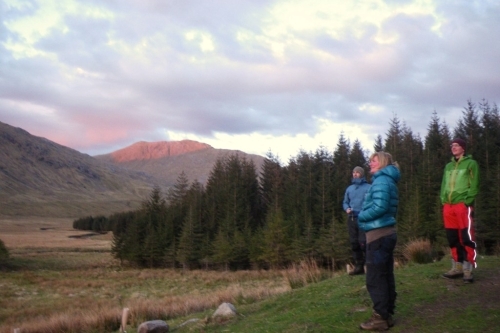 One intrepid man describes arriving at 2.30am after walking here under a canopy of stars. Another came for solitude on New Year’s Eve. 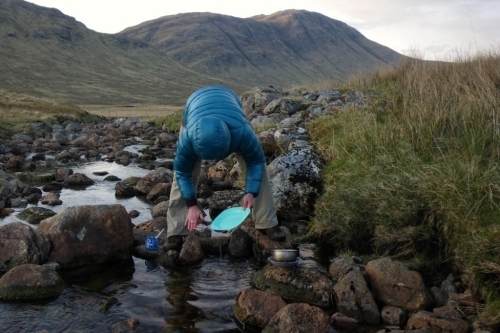 Washing the dishes in the river as the light fades. We made our beds on the floor (bivvy bag, mat, sleeping bag), hung everything else up from various hooks and nails (there might be mice and other critters about) and then went out to collect some wood. The land is bare, but we pulled a good lot of damp logs and sticks from the peat, trees, I guess, that had once stood here. We’d brought a ‘sparkle log’ with us and a bit of kindling, but it’s good to stock up the woodpile for others who might arrive in need. These hills are unforgiving places. After some dinner (couscous and chunks of chorizo), we popped out to wash the dishes in the burn. A herd of deer stood silently watching. The mountains softened as the light began to fade and glow. It felt truly, immensely, peaceful. Back inside, the flames whipped up the chimney and the whisky rattled into my tin mug. We sat by the fire, snug and warm, far from the rest of the world. The night, however, was long and cold – my sleeping bag wasn’t up to the job. About 5am the door rattled, hard and insistent. A deer, we hoped. I woke up muggy and smelling of smoke, so, after a trip up the hill with a spade, I cleared my head with a quick flinty-cold wash in the burn. Fuelled with coffee and syrupy oats, we were ready for day two. The path was tricky to spot, so we followed the trails of an argocat – the all-terrain, off-roader that taxies deer stalkers though this wild country. It was boggy and slow going. We passed a pool, deep and perfect for a swim, and climbed until we reached a wide plateau. After tripping around peat bogs and peat hags, we picked up a neat little path that followed the burn through the col. Glendessary lay below, and we could just make out the clearing at the edge of the wood where A’Chuil, our bothy for the night, sat. After munching on babybel and oatcakes, we pressed on. Watching the sun set outside A’Chuil. As we got closer, we saw figures. 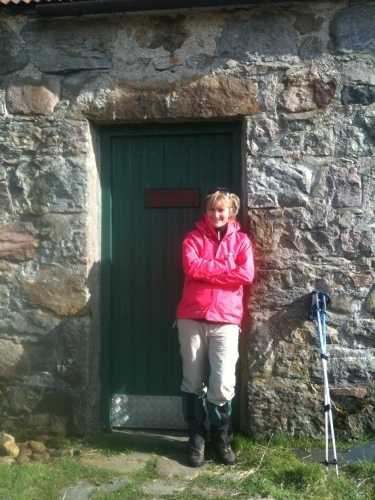 This bothy wasn’t empty. We’d be sharing our night with two German blokes, an English couple and a pair of Scottish old timers. Three others were in the middle of packing up and shipping out. We all sat outside in the evening sunshine cooking up our food and passing the time. There was talk of the best freeze-dried food, journeys made and journeys ahead, wild pigs, the weather, sporks, how tampons make good kindling. On the hillside in front of us, the twilight picked out the ridges and furrows of run rig farming, an old sheep enclosure and the remains of a stone cottage, reminding us that people had once drawn life from this land; that this wasn’t a pristine playground. Leaving A’Chuil in the morning. There are two rooms at A’Chuil, both with sleeping platforms and open fires. Morven and I were in with the Germans. We sat by the fire, chatting, laughing, drinking whisky and enjoying the company before climbing into our sleeping bags. It was another long night. There were two snorers, and the windows rattled with each inhale, each exhale. An extra strong coffee was needed to kick-start the day. It was a beautiful spring morning as we said goodbye to our new friends and made the walk out along the forest track. We reached the car and, with perfect timing, the cuckoo, called, still, seemingly, searching for his mate. Driving back along the side of Loch Arkaig, I caught sight of myself in the rear-view mirror. My face was dirty and my hair was a mess, but there was a sparkle in my eye. I looked refreshed, revived. I’d been bitten by the bothy bug. Morven and I pencilled in a date for the next trip. I mentally made a note to order a new down sleeping bag and buy some earplugs. A big, big thank you to Morven for sharing this trip with me. Experienced bothier, expert map reader, snack provider, much-better-than-me photographer and patient friend (even when I do accidently pocket the pot grip). 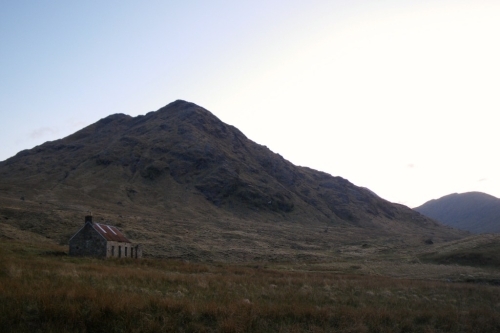 The Mountain Bothy Association‘s website has loads of information about bothying.